In this chapter, we present several empirical analyses that assess the performance of HEAD-DT in different scenarios. We divide these analyses into two sets of experiments, according to the meta-training strategy employed for automatically designing the decision-tree algorithms. As mentioned in Chap. 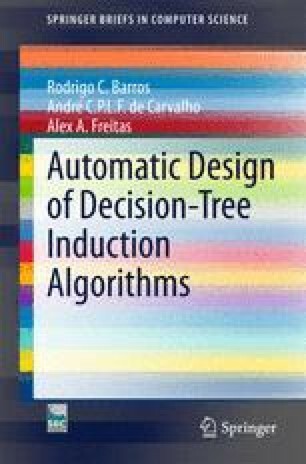 4, HEAD-DT can operate in two distinct frameworks: (i) evolving a decision-tree induction algorithm tailored to one specific data set (specific framework); or (ii) evolving a decision-tree induction algorithm from multiple data sets (general framework). The specific framework provides data from a single data set to HEAD-DT for both algorithm design (evolution) and performance assessment. The experiments conducted for this scenario (see Sect. 5.1) make use of public data sets that do not share a common application domain. In the general framework, distinct data sets are used for algorithm design and performance assessment. In this scenario (see Sect. 5.2), we conduct two types of experiments, namely the homogeneous approach and the heterogeneous approach. In the homogeneous approach, we analyse whether automatically designing a decision-tree algorithm for a particular domain provides good results. More specifically, the data sets that feed HEAD-DT during evolution, and also those employed for performance assessment, share a common application domain. In the heterogeneous approach, we investigate whether HEAD-DT is capable of generating an algorithm that performs well across a variety of different data sets, regardless of their particular characteristics or application domain. We also discuss about the theoretic and empirical time complexity of HEAD-DT in Sect. 5.3, and we make a brief discussion on the cost-effectiveness of automated algorithm design in Sect. 5.4. We present examples of algorithms which were automatically designed by HEAD-DT in Sect. 5.5. We conclude the experimental analysis by empirically verifying in Sect. 5.6 whether the genetic search is worthwhile.